MUMBAI: Erica is one of the most popular television actresses. She currently essays the role of Prerna in Star Plus’ Kasautii Zindagii Kay. The actress has a massive following and is loved by one and all. Erica is so beautiful that it is no surprise that many actors want to be in a relationship with her. In fact, there is one famous television star who wished to be Erica’s boyfriend. The actor is none another than Karan Wahi. Karan and Erica are great friends and share a fun bond. 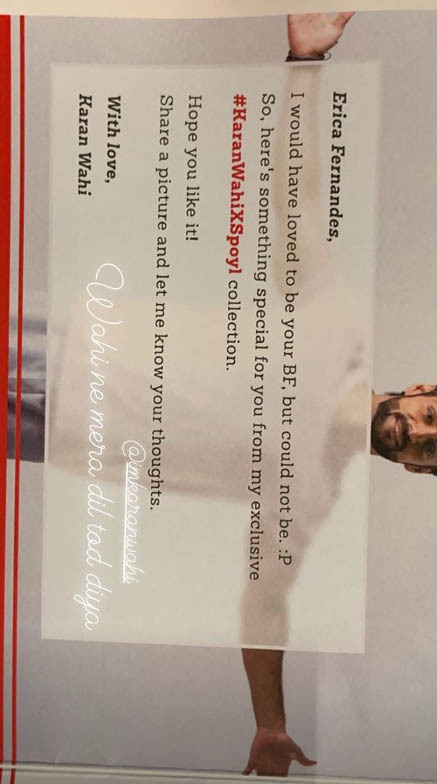 Recently, Karan sent a hamper and t-shirt to Erica from his collection of Karan Wahi X Spoyl Collection. He also sent her a note that said that he wanted to be your boyfriend but couldn’t be. Erica replied that Karan had broken her heart. The t-shirt she wore read ‘My Boyfriend’s Tee’, which surely makes us think something is fishy. But these two would look really adorable if they ever dated each other.